A journey through Himachal holds the promise of a deep and refreshing communion with nature in its varying beauty. The lush river valleys surrounded by snow-capped peaks, the fruit-laden orchards, gurgling streams and the dense forests that echo with birdsong evoke enchantment and delight. Closer to the Greater Himalayan and Zanskar range, delight gives way to awe as one is faced with the stark, haunting landscape of the cold desert. Here, still lakes gleam like emeralds and sapphires amidst towering white mountains that stand aloof and forbidding in their majesty. The four great mountian ranges and a fluctuating snow line gives Hinachal very cold climate. Though there are some regions which have hot summers and cold winters, majority of the trekking routes fall in those areas which are perenially cold. Thus trekking in Himachal requires adequate preparation to brave the cold wintry climate. For moderate to strenuous treks, the best season is from June to October. 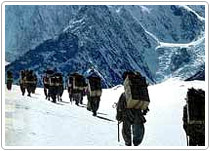 It is advisable avoid the winters for trekking. From Brahmour in the Ravi valley, the tracks follow the Gaddi trail in the Budhil nala and across the Kugti, Choia and Kalicho passes lead to the Chenab valley in Lahoul with the optionsof continuing to Leh, Spiti or Manali. Driving out of the Ravi valley, the road takes in the Khajjiar meadow and a diversion to the old hill station at Dalhousie. 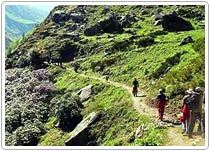 The treks can be divided in few categories like Shorter options, Tough option, Watershed, countless flora and many more. Drive from Kullu and reach the Manikaran hot springs . From here one can take a walk along the Parvati to the secluded village at Pulga. One can take short excursions upstream from here and return to Manikaran. This can be combined with a trek up the Tosh valley bordered by the Pir Panjal range and Papsura and Dharamsura peaks. Another 10-11 day trek can be taken up form Manikaran along the Pir Panjal range. The trail winds its way past Khirganga, Mantalai glacier to the top of the pass on the Kulu-Spiti divide. One reaches Dhankar in Spiti from where one can drive to Kaza and the Kunzum pass into Lahoul or take the Hindustan-Tibet road for Shimla. There are number of trekking routes originating from the world's most prominent watershed. Chitkul (11,000 ft) in Kinnaur district, five to six trek days over the Rupin Pass lead to the Naitwar in the tons valley, over the Borasu pass to the Haridun valley and the Lamkhaga and Chotkhaga passes to Harsil in the Bhagirathi valley. Moderate treks (4 days) can be taken over the Sutlej-Beas watershed. Moderate to strenuous trekking for 5 days, over the Beas-Chenab watershed leads to the Hamta Pass on the Pir Panjal range. The trek offers some excellent views of high peaks such as Indrasan and Deo Tibba. The Chandrabhaga triangular trek traces sources of the Chenab . Then there is the moderate trek for 3-4 days accesses the Chanderkhani pass. The trek begins at Jari and gets to the secluded Malana village, which is said to be among the world's oldest democracies. The Sach pass crossing entails fairly strenuous trekking for 4 days. The trek begins at Trela. Once the Pass is crossed, there are ample opportunity for the crosssroads enthusiast. 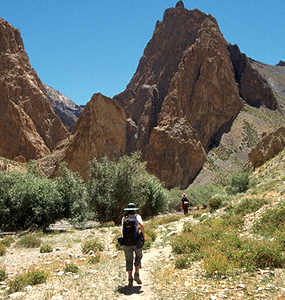 Enjoy the 4-day trek tackling the Indrahar Pass. The trek originates at Dharamsala, home of the Dalai Lama, high above the artistic traditions of the Kangra school and descends to Chunarta near Brahmour. There are many path options form here. Some of them are quite tough and require execellent physical conditions to brave them. The Kugti, Chobia and Kalicho passes on the Pir Panjal range tie up with the Miyar nala in the Chenab valley and Lahoul, providing choices along the east fork to the Rohtang pass and Manali on the west road to Keylong, Baralacha pass and Leh. The Kugti and Kalicho passes have trek routes stretching between 5-6 invigorating days. One of the Himachal's classic routes is the Chandra-Bhaga triangle and the Bara Lacha Pass. It has a number of entry points and exits enabling many combinations. One of the most fascinating routes in Himachal is from Manikaran to Pulga rest house along the Parvati river. This continues via Khirganga and Mantalai glacier to reach Pin Parvati Pass on the Kullu-Spiti divide. Descend to roadhead at Dhankar in Spiti.